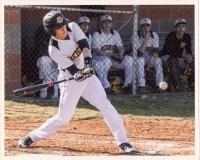 Varsity co-captain Adam Rosenbaum at bat during the 2015 season. When the Heights High baseball team found itself without a field due to renovation at the school, top officials from the school board and the city, along with coaches and parks department personnel, worked together to find a solution. Months of meetings, measurements and problem-solving have resulted in upgrades to Forest Hill Field No. 4, which will serve as the high school home field this spring and next. The 2016 season runs April 1 through mid-May. While field upgrades were being finalized, more citywide baseball initiatives were under way. Assistant Varsity Coach Evan Knoblauch worked with the city’s Parks & Recreation Department to bring the highly regarded Cleveland Indians Youth Baseball camp to the Heights. “Five other cities in the area host the camps, why not Cleveland Heights?” Knoblauch said. “Our youth deserve the opportunity.” The camp will run July 25–29. Registration information can be found on the Cleveland Indians website (http://bit.ly/indianscamp). The teamwork doesn’t end there. This spring, the city and volunteer coaches are hosting a series of free baseball clinics for kids ages 9–14. The clinics will be supported by varsity players from the high school team, giving youth players an opportunity to work with higher-level players, and providing a mentoring opportunity for all. Players must be registered in the city’s youth baseball program to participate. More information is available at the city website (http://bit.ly/youthbbclinic). Come on out and cheer on the boys of summer at Forest Hill Field No. 4. Two of this season's highlights are a doubleheader on April 16, and an April 23 doubleheader at historic League Park in Cleveland. Built in the late 1800s, League Park, the site of the 1920 World Series, has been restored. The latest schedule information can be found at http://www.chuh.org/baseball.aspx. Barbara Rosenbaum is president of the Heights Baseball Boosters, the parent group that supports the high school baseball program.